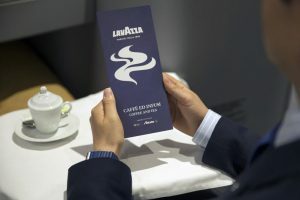 Alitalia has signed an important three-year partnership deal with leading coffee manufacturer Lavazza renowned worldwide, allowing passengers on the Italian airline’s 147 routes to savour an exclusive range of coffees. High-quality instant coffee from a blend of 100% Arabica beans, produced especially for the Italian airline, will be available for travellers in all classes. Business Class passengers on long-haul flights will also be able to choose special coffees à la carte among three different blends of espresso selected for Alitalia, in addition to decaffeinated and instant coffee. The three quality blends available on board are iTierra!, a fully sustainable coffee from Rainforest Alliance certified farms, offering intense taste with hints of chocolate, Gran Riserva, with its rich, full-bodied aroma and sweet, sumptuous flavor, and Gran Crema, a well-balanced classic Italian espresso. Under the agreement between the two companies, Lavazza coffee will also be served in Alitalia lounges in Italian and international airports. The Alitalia-Lavazza partnership shows the two companies’ commitment to taking Italian excellence to the rest of the world. The art of coffee blending was the brainchild of the company’s founder, Luigi Lavazza, who invented the concept in his shop in Turin over 120 years ago, combining different coffees from a variety of sources, as the company still does to this day. Alitalia and Lavazza have joined forces to offer passengers a quality experience, both in the air and on the ground.